In conjunction with the Islamic New Year on the 21st March Voices for Creative Non-Violence is holding a weekend of solidarity with Afghans who will be facing uncertainty and the possibly of an escalation in conflict during the renegotiation of the international presence within Afghanistan. Kite flying has become synonymous with Afghanistan as a well loved pursuit which was banned under the Taliban, now Afghans are more used to the presence of UK armed and surveilance drones flying overhead. We are encouraging peace groups, Afghans in the UK and the Muslim community to fly kites in solidarity with Afghans who now have to live under the mental pressure and physical destruction which British drones (currently operated from RAF Waddington, Lincoln) now reap upon Afghanistan. Take a photo and send us a mini report of your action. 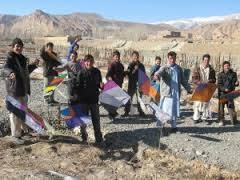 Make signs saying "In solidarity with peace for Afghans", "Fly Kites Not Drones" etc and give out leaflets. Join a mass kite flying theatrical event in central London led by the feminist protest group 'The Activettes' who will be making props and costumes for a flamboyant daring and never forgotten action! 4) GLOBAL DAYS OF LISTENING Skype the Afghan Peace Volunteers on the 21st March, share messages of solidarity and peace, an activity especially suited for young people and groups. VCNV UK 2013 Peace Delegation Get Ready to Depart! The 3rd UK peace delegation are getting ready to depart for Kabul where they will work and stay with the Afghan Peace Volunteers. The delegates are Maya Evans, Janey Moffatt and Beth Tichborne. A short documentary looking at the pregnant women in Afghanistan who are set to give birth in the "new Afghanistan" of 2014; looking at the conditions of pregnant women where 1/11 die in child birth. The documentary will be released on the 8th March 2014 and VCNV speakers will be available to talk about the project and tell the stories of women they met and interviewed. A booklet explaining the last 33 years of conflict in Afghanistan told via the histories of the Afghan Peace Volunteers. VCNV Delegates are available to speak with groups and organizations in 2014, we are taking bookings now.